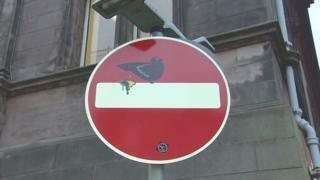 A street artist who hacked about 20 road signs in Edinburgh city centre said they had gone unnoticed for 18 months. 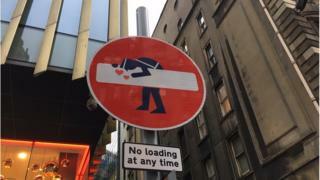 Frenchman Clet Abraham, 52, has confirmed he was the artist behind the altered signs including sumo wrestlers and wine glasses. He said he hoped they remained in the streets as they were for everyone. 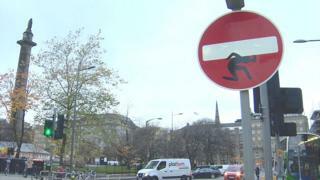 Speaking from his home in Italy, Mr Abraham told the BBC Scotland news website it normally took between three to four months for people to notice his art work on road signs in other cities across the world. 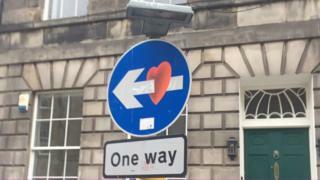 He said: “I was in Edinburgh in March 2017 so it was very slow for there to be a voice about my work, I find it very funny. 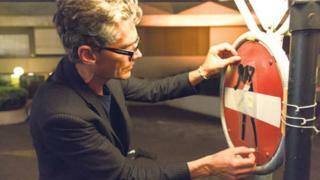 “I never cover more than about 10% of the sign as I don’t want to disturb the meaning, which is very important to me. 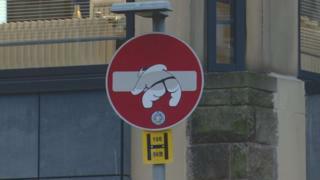 Mr Abraham said he had also left his stamp on 10 signs in Glasgow. He said he had picked Scotland because he had a cultural affinity with the country and its green landscape, and he singled out Edinburgh due to its “beautiful” architecture. The artist takes between two days and two years to come up with each design before hand drawing it and then putting it onto a computer to make a sticker. He has hacked signs all over the world and been arrested in Japan. He was caught by the police several times but has usually been allowed to carry on once he has explained to the police that he is “not a vandal”. He said: “I take care to do it at night and it doesn’t take long as I’ve already made the stickers but yes I have been caught in Italy, London and Japan. “My girlfriend is Japanese and when I was arrested I was banned from entering the country and she was banned from leaving the country for five months. It was the worst day of my life. 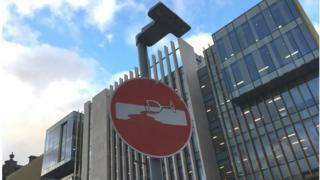 He makes extra signs he then sells to private clients and buys the signs from councils who take them down. His signs sell for between £1,000 and £10,000. 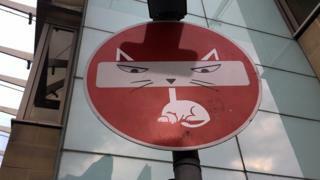 So why not remain anonymous like his fellow street artist, Banksy?